Continuing on from last week’s post on extreme weather and the devastation it causes, some places are actually doing something. The City of Toronto, for example is tackling the flooding issue by upgrading its storm and sewer systems in the older parts of Toronto. I live in one of them and because a previous council and Mayor screwed up back in 2000, with the sewers in my area (they put in the wrong type that apparently don’t do the job), it all has to be done again. My area is scheduled to have the streets, etc. dug up in 2020 or 2021. Because of the mess and more than inconvenience to me and the others in my neighbourhood with that fiasco, I am on watch and warning and have let my councillor know and why. But the city councillors may have learned some lessons in that all upgrades will be done with other repairs, upgrades in the area at the same time, finishing up one area with all – sewers, street lights, intersections, streetscapes on the main street- before going to the next. And we will have contact people and their info to nail if things go wrong. They are also going to make sure we know where to put our garbage and recycling during that time as that was one of the big complaints in 2000. Logistics covered, what exactly is the point of the new storm sewers as far as basement flooding is concerned? I know from experience that not all basement flooding is caused by sewer systems that can’t hold all the excess rainfall water. My situation of basement flooding has a lot to do with foundation cracks, most of which are the fault of that jerk contractor Nigel Applewaite who didn’t do the water proofing correctly – he didn’t dig down far enough and when I called him on it, blamed it on drains and said to get the drains checked by the City. I did – twice – no problem then. But, old storm sewers, catch basins and the like can factor in. I just have to look on my street and neighbouring streets to see how few catch basins there are and how the water puddles on the street. And why do I have two catch basins close together on my street when the others basins are so far apart? For those more information on how storm sewers and the like operate go here. As all this takes time, let’s hope it isn’t too little too late. The other thing the City of Toronto has been doing since 2010 requires new buildings of a certain height (and other criteria) to build a roof garden – this one is mainly to create more diversity, but also to help offset one aspect of global warming – help keep roofs and inside cooler on those extreme hot and humid summer days. Vegetation will do that. In fact Toronto has been touted as being the North American city with the most green roof space. Then there is global warming and one other thing cities seem to have way too much of – concrete. Concrete does not absorb water from rainstorms. Maybe the city should also consider getting rid of a lot of the concrete on the ground and putting in grass or gardens. Actually, there is some progress here. My area’s sewer replacement program includes putting in a water garden in the middle of one of the residential roads. Maybe we need more of that. And downtown open areas are being made into parks. Which is all good. Here are some links to roof and other gardens. Meantime, the extreme weather keeps barrelling in everywhere in the world. No place is safe anymore to live. God doesn’t seem to be doing much, if anything, to help so we have to try to fix it ourselves. I can’t put in a roof garden – even if I could afford it. My roof slants. But I have over the years planted perennial, herb and vegetable gardens in the ground – front and back of the house. I’ve had my downspouts disconnected and had extensions put on them, and have heat cables on the roof to try to melt snow and prevent it from changing to ice and ending up with ice jams, which when melting can end up in the basement. And letting others know who not to hire to water proof their basements. What are you doing to offset global warming and the like? The disastrous weather continues and escalates. We in Toronto, Canada were spared – this time – with a bit of freezing drizzle and a bit of snow at the end of last week, but the east coast of Canada (particularly Corner Brook, Newfoundland and the United States (particularly Vermont) got flooded and iced out. We are living in war zones, folks, and it doesn’t look like it will get better. For those of you who blame all climate change on us humans – that isn’t the whole story. When 20 to 21 per cent of climate change is caused by volcanoes, you can’t put the guilty tag on humans for that one. And there are scientific and historical facts that bluntly point to humans not being responsible. There is also plenty of the reverse – humans caused climate change and in doing so all the mess our climate is in now. Here are a few links for both sides of the global warming issue. I’ll let you read for yourself and decide. How Do We Know that Humans Are the Major Cause of Global Warming? You can Google for more stories – pro and con. My take? Some human causes; some “natural” causes. And maybe “dog” spelled backwards has something to do with the natural causes – depending on what your beliefs are about God and how the world began. One thing is clear to me. God does not seem to be listening to us most of the time when we ask to be spared from the devastating weather that destroys our homes, our cities and towns, our countries, our lives – yes, floods, ice storms, etc. kill people. Or help us when we ask for help in the aftermath. I am always amazed, and yes dismayed, when people who have lost their homes and are displaced thank God they are still alive. Be that as it may, I would like to revisit their stories six months down the road and see how they feel then. I haven’t got one that will fix it all. But folks, I do know, we have to deal with all this devastation ourselves- prevention, when it happens, and afterwards. We are doing the latter two – we are forced to. Prevention? Yes, some places had plans to fix that damn, etc., but then the floods came – with heavy rains. Too little too late. Next post I’m going to show what the City of Toronto is doing towards the flooding issue (and let’s hope it is not too late). Southern Ontario has been blasted with rain, thunder and lightning from late Sunday evening. The thunderstorms kept me awake with the noise and the worry of possible power outages and basement floods. I even got up once and checked the basement, but no water getting in then. The weather forecast looks very gloomy this week, except for Thursday, parts of Saturday, and Sunday. We don’t need all this rain in a short time – neither do the gardens and lawns. That is especially true in urban areas. The study was conducted in Sydney, Australia at the University of New South Wales where scientists focused on 40,000 storms that occurred in Australia during three decades. Just that number of storms is terrifying. What the scientists found out is even more terrifying – these warming temperatures (and yes, they used the cop-out cause of “climate change”) are messing up the patterns of the rain within the actual storms. The two researchers – Ashish Sharma, a professor in the university civil engineering and environment school and Conrad Wasko, a PhD candidate there – also figure that this is true for around the world. While frightened and yes, angry, about all this, I am really not surprised. From what I’ve seen, not just from The Weather Network, but up close and personal, the weather worldwide has been going beyond hell in a hand basket as we entered the 21st. century. There were a few signs in the late 1990s but the situation has escalated a lot since we hit 2000. These bad weather patterns are only the tips of the rainfall (we may not have much in the way of icebergs in the near future) – that show me, the whole world in too many ways is skyrocketing off balance. No wonder I am crabby and angry a lot of the time. But I received a most welcome blessing last evening. Besides not getting the thunderstorms predicted for the afternoon and evening (God listened for a change), the sun was shining, so I decided to go for a walk. As I headed down my driveway a man walking by was verbally admiring my garden. He’s right. 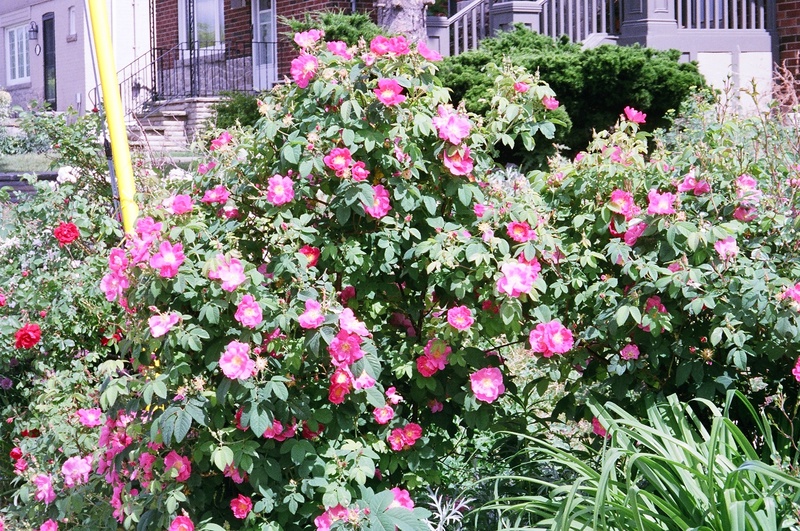 The first lot of rosebushes are blooming red and white and they are fragrant; there are pink peonies, even the chives are doing their part with purple flowers. It made me think. My garden is beautiful. It is also one of the few good things about this climate. So, go out in your garden and enjoy. If you don’t have a garden, go to a public garden or park with a garden; walk along the street and look at your neighbour’s gardens. Do this while you still can, while all this is still here. Before the rain comes and floods it all away. Yesterday I spent a bit of time clearing some of the garden. Removing the dead perennial stems and branches so that the tulips, crocuses and hyacinths could appear in all their glory (finally) helped bring on the illusion of spring. I say “illusion” because of all the crappy weather occurring in North America and elsewhere in the world. I’m not convinced spring is here to stay but I’m taking what is offered. The ritual and actual practice of doing anything in the garden tends to slow me down, including my usual racing mind. I can admire the different colours (although mostly purples so far) and smell the hyacinths. I can check out the tulip plants and see the beginning of a bulb in one and imagine the red tulips that will emerge and colour my garden. If the “weather” doesn’t mess it all up. Not a fanciful worry if you take into account all the recent/current floods in Ontario’s cottage country, in Illinois and Texas and what is just waiting to happen in North Dakota and Manitoba. There was even a tornado in Shelbourne, Ontario over the weekend as well as snow in different parts of Canada and the US. Around the world there are earthquakes, snowstorms, heavy winds, droughts, extremely hot and humid weather, etc. – much of it way out of typical seasonal weather. But nothing is normal about the weather on planet earth anymore. No matter where you live you can’t escape it. The mostly calm and normal weather when I was growing up in the 1950s and 1960s in southern Ontario, Canada (Toronto to be exact) no longer exists. Sure we had hot humid summer days (and no air conditioning). 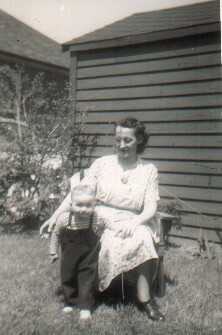 My mother used to set up the card table and chairs in the shade in the backyard or in the unfinished basement and bring out all the dishes and food for supper. Sure, we had Hurricane Hazel hit us in fall 1954 (and that is dating me) but that was it for extra-ordinary (that I can remember). None of these extremes in weather we experience now and certainly not what is now a given – basement flooding at some point or points in time. And I’m going to go out on a limb here (figuratively speaking, for now anyway), and say I’m not sure it is all human-caused global warming. I’m not religious, but I think there might be something in the “ranting” and “predictions” of some religious groups. The world didn’t end in October 2012, but when you see/read about all the crazy weather, you start to wonder. To paraphrase a line from a commercial “it’s not nice to offend Mother Nature” – however, Mother Nature is a figment of someone’s imagination. I’ve touched on this in a previous post. The very word “Mother” does not bring up visions of constantly living on the edge of a bad weather precipice. So what is one to do? I’m going to try to get out in the garden as much as I can…and enjoy the relative peace – that is when I’m not anchoring down garbage bins, chairs and potted plants. 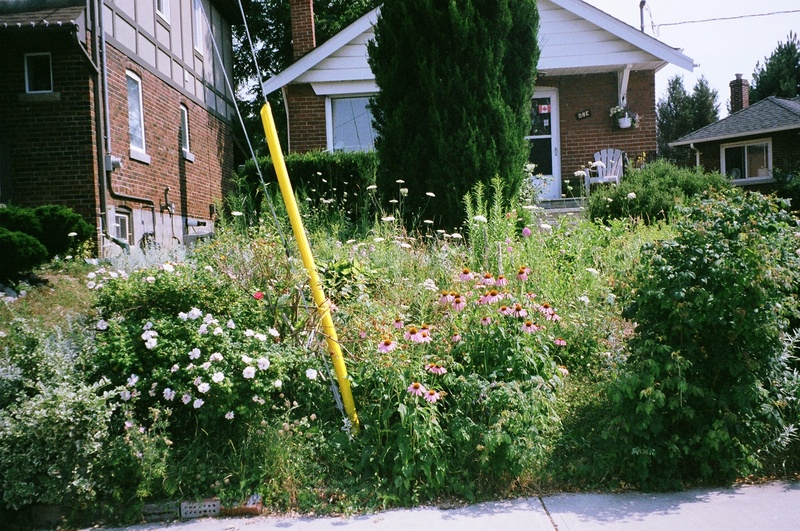 Only Child’s front garden – later in summer.